Swimming is one of America’s favorite summer pastimes. In addition to plunging into the ocean and freshwater lakes and streams, water enthusiasts love to frolic in the 10.4 million residential and 309,000 public swimming pools in the country. If you’re a proud owner of one of these pools, you should know that water quality is necessary for a happy, healthy summer full of pool activities. It is a good idea to test your pool’s water using a chemical test kit two to three times per week. If you’re having issues or using your pool a lot more than usual, you may want to check your water quality more often. A good pool test kit will test the levels of all these chemicals: pH, total chlorine, calcium hardness, acid demand, and total alkalinity. If you want to test for more chemical values, there are in-depth tests that will allow you to do so. You can also take a water sample to your local pool store. However, this can get very time-consuming, which may make it difficult for you to keep up with regular testing. To collect an accurate sample that’s representative of your pool’s actual water quality, avoid collecting water from the top of the water or from around water collection areas (such as drains or filters). Instead, pull a sample from a depth of 18 inches. Your kit will contain several vials with fill lines clearly marked on them. Be sure to fill each vial to the line before adding the testing chemicals. Read each reagent bottle for dosing instructions. Most will instruct you to add a specific number of drops to the water. Always add the reagents slowly to ensure proper dosage. After adding the test chemicals, cap the vial and gently swirl the contents together. Wait the appropriate amount of time and compare the color result with the color-coded table, which may be located on a card or attached to the vial itself. It’s a good idea to record all results in a notebook for future reference. Doing so will allow you to spot trends and subtle water quality issues before they become big problems. If you keep your water quality readings within these ranges, you will have few problems maintaining your pool. If your pool chemical levels aren’t in these specific ranges, you’ll need to take further steps. Correcting poor water quality readings usually means dosing your pool with certain chemicals. For example, sodium carbonate increases pH whereas sodium bisulfate lowers pH. There are also chemicals to increase or lower alkalinity, increase hardness, stabilize chlorine, control algae, reduce cloudiness, etc. In certain instances, you may not have to add chemicals at all, but you may have to dilute the chemicals in your pool by adding water or performing a partial water change. Pool chemistry can be complex. For this reason, it’s a good idea to ask a pool professional about the proper chemicals and dosage needed to correct your readings. 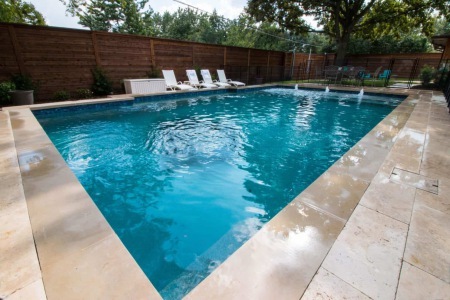 Whether you’re looking for more information on this subject or would like a pool company to take care of pool maintenance and chemical balancing for you, contact Summerhill Pools.